DO THE TWIST Calatrava’s Fordham Spire is awaiting approval from the City Council. Its design reflects his desire to incorporate motion into architecture, as with his Turning Torso. 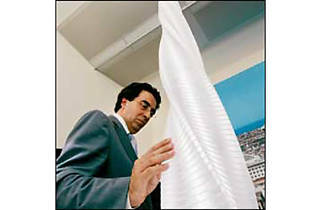 Santiago Calatrava is threatening to usurp Frank Gehry as the most buzzworthy architect putting his mark on Chicago. On March 16, the Chicago Plan Commission approved Calatrava’s design for the Fordham Spire, a $550 million, 124-story hotel and condominium tower that would be built at 420 East North Water Street, near the entrance to Navy Pier. If completed, it will be the tallest building in the nation, at 2,000 feet. Developer Christopher T. Carley hopes the project will break ground by early 2007 and be completed in 2010, but its survival is by no means assured. Even if the Fordham Spire is approved by the City Council, Carley may find it difficult to come up with the funds for the massive skyscraper, its circular plaza, six-story parking garage with a landscaped roof and a riverwalk promenade. But Calatrava’s recently revamped design has some powerful supporters, including Alderman Burton Natarus, in whose 42nd Ward it would be built, and Blair Kamin, architecture critic for the Chicago Tribune. In Calatrava’s latest proposal, the steel and glass Fordham Spire floors rotate a full 360 degrees from top to bottom around its concrete core. The twisting structure (resembling a drill bit) reflects his ongoing attempts to incorporate motion into architecture. 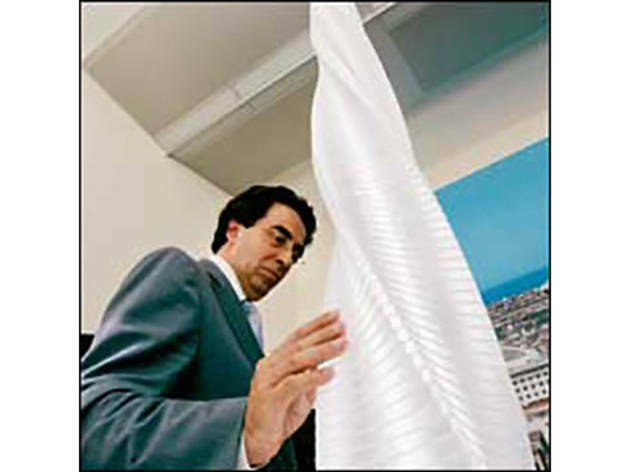 Calatrava, 54, was born in Valencia, Spain, and studied architecture and urbanism there before moving to Zurich—where his main office is now located—to pursue a Ph.D. in civil engineering. He first made a name for himself designing bridges, such as the Puente del Alamillo in Seville, which was created for the Expo 1992. Significant architectural commissions followed, including the City of Arts and Sciences in Valencia and the Athens Sports Complex built for the 2004 Olympics. Until now, Calatrava was probably best known in Chicago for his first project in the United States: a 2001 addition to the Milwaukee Art Museum. Due to its famous brise-soleil (the winglike architectural centerpiece), which has louvers that open and close, the building’s cost overruns were as breathtaking as its aesthetics. Calatrava has recently been tapped to design two buildings in New York City: the World Trade Center Transportation Hub, which should be finished in 2009; and 80 South Street, a Jengalike luxury apartment tower that soon will be under construction. The tower is made up of 12 jagged cubes, each containing four floors; each cube provides a terrace for the one above. His other American projects include the Sundial Bridge at Turtle Bay in Redding, California, which opened in 2004; and the Atlanta Symphony Center, which is still seeking funding.